The dust from this year’s Intercity Games has finally settled, and what a Games it was! The weather was perfect, we achieved a record breaking turn out of competitors and there wasn’t one player that didn’t earn that delicious, three-course meal that followed! After some time catching up with fellow Rabblers from across the country (and globe! ), the day kicked off with a cluster of games in the Round Robin round (robin), which was essentially 80 players on one football pitch going head to head in fast-paced, mini Rabble games with the goal of racking up as many points as possible! The Round Robin included some familiar classics, windy-sun-in-your-eyes Netsketball, tiny-intense Capture the Flag and sweaty Ball Tag to name a few! After each team battled their way through 4 mini-games each, they were split into their heats for one big Hunger Games *whistles with fingers in the air*. 40 players on each field stole not so glowing-glow sticks from each other’s districts and sprinted them back to their own to score a point for their team. Having the substitutes from each team waiting patiently within the capital for the whistle to signal a substitution, meant you never really stopped running (we were knackered)! Two Hunger Games ran at once, and not to name any names, but there was definitely some Hunger Games inception going on with players stealing from unsuspecting districts in the other game! Next year there will be punishments (death). Once the citizens of the war-torn Intercity Games had been liberated (Hunger Games reference), each team lined up in anticipation for their numbers to be called for what turned out to be a very amusing Sports Day Relay. 4 teams would go head to head, to see how much they remembered from the grueling days of competing in ridiculous food based, sports at primary school in front of your parents. 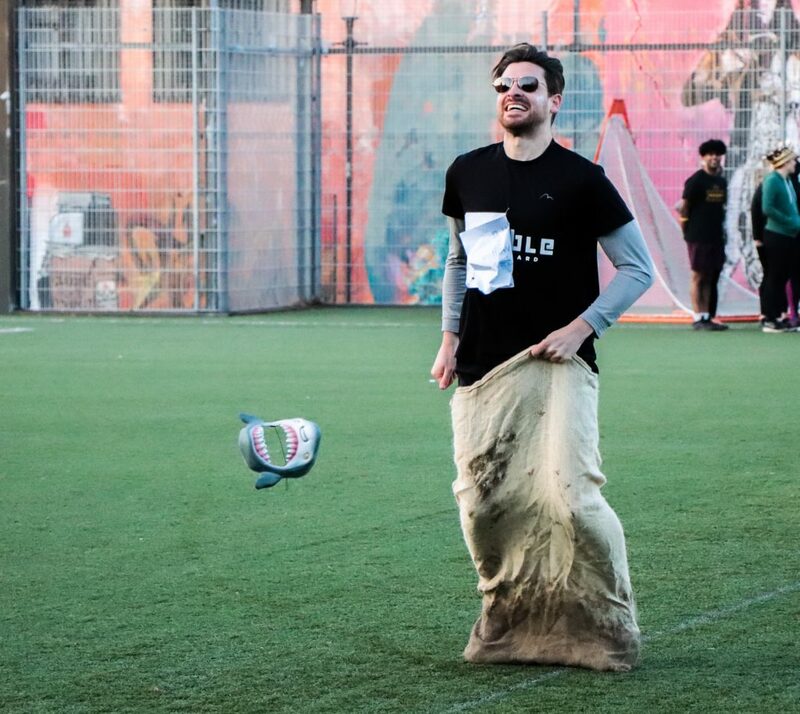 Each team was tasked with completing a lap in the classic potato sack race, followed by running (or skating) in slippers, followed by the very British egg and spoon race! For three relatively basic tasks, there were some very questionable techniques on show, one team stuck on clown shoes instead of slippers, one team ripped a hole in their sack (but very admirably continued to follow the jumping rules), and some, rather audaciously sprinted with their eggs, only to embarrassingly stumble, dropping them and having to do it all over again! Needless to say, none of us have got better at sports day-ing with age. But we all tried! And it was very, very funny. The final game saw teams neck and neck on the leaderboard play-off against one another in possibly our favourite game, Circular Dodgeball! Teams racked up some ridiculous scores, some passing the 6-minute mark! But those incredible scores simply weren’t enough, as Hyde Park’s Ninja Turtles dodged, ducked, dipped, dived and dodged their way to sweet, sweet victory, and well deservedly raising the Intercity Tankard! However, we saw no better way of concluding the day’s festivities than a big ol’ game of British Bulldog, starting with Team Rabble in the centre (possibly the least competitive players north of the equator)! 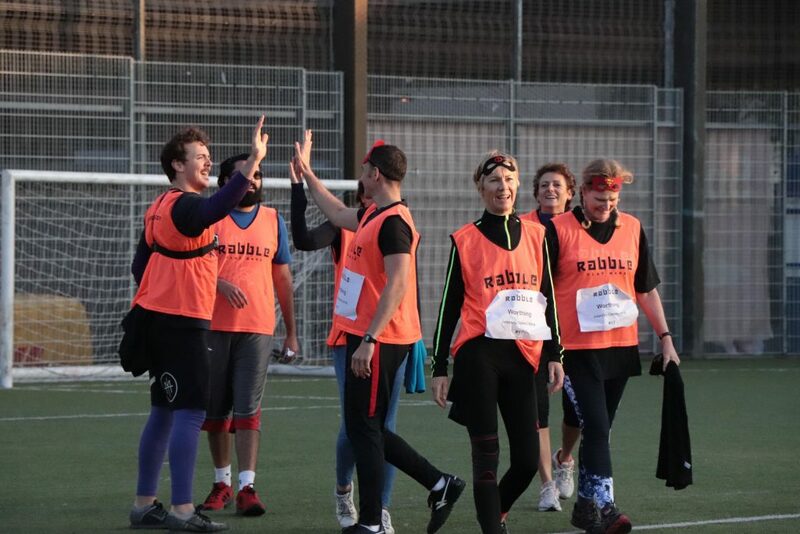 Everyone gave it their all in the final few sprints of the day, burning those final few calories, before we all rushed to the showers, cracked open a few tinnies and headed to Jerusalem Bar & Kitchen for hip wiggling, musical chairs, lots of good wine and even better company! 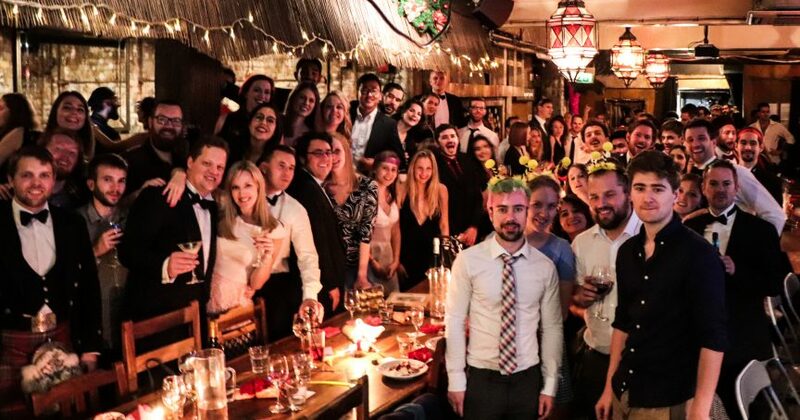 Although the dinner was a great excuse to dress up, drink and eat a little too much; it was also the perfect opportunity for us to give back to the community (in the form of silly prizes). We asked you (the community) to nominate players and instructors for various awards, highlighting your favourite moments and people, and you did not disappoint! 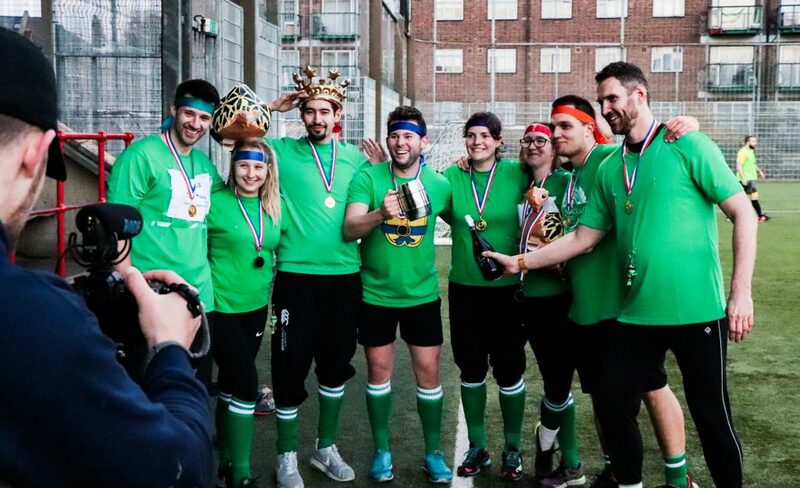 We gave a Harry Potter mug to a player named Derrick for bringing a broomstick to his first Quidpitch game, we gave tiaras to our two socialites Polly and Lottie and we gave a framed picture of Shakira to Tom, a player with the best hips in Rabble! 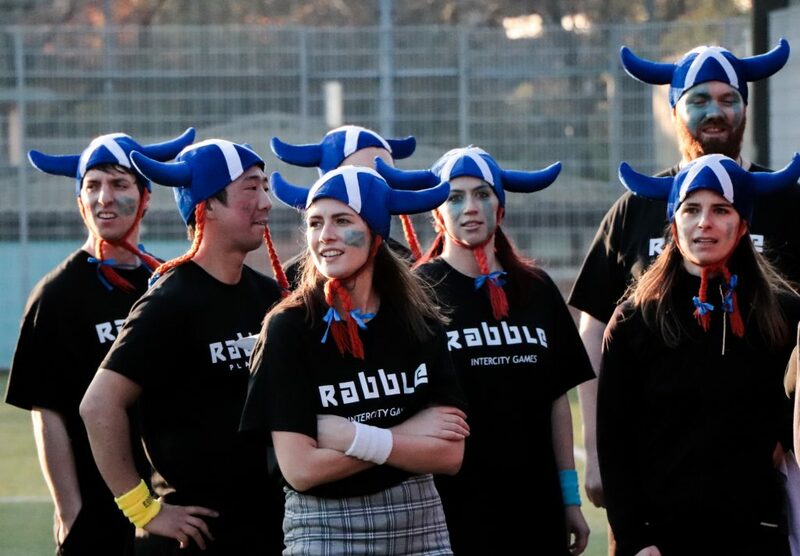 But a special shout-out is required to Guilia and Sophie for winning Rabble Players of 2018! And congratulation to our runners-up Emily, Sam and Ameen. Thank you all for helping make Rabble the fun, welcoming community that we are today! The final rankings of the day; in 3rd place were Clapham, in 2nd place was Edinburgh and in 1st place was Hyde Park! Congratulations to all of you, and everyone that made this year’s Intercity Games all that it was. Will the Ninja Turtles, Hyde Park be dethroned? Will someone ever hit Mathew in Circular Dodgeball? And will anyone fancy dress as well as the INCREDIBLE Manchester?Find out next year on The Intercity Games 2019! The Intercity Games will be back next year! Miss out? Not to worry! Our next annual event is the Rabble Ski Trip in March 2019! Early Bird tickets are now available to purchase by leaving a deposit. For more information and to secure your skis; click HERE!